We are victims of what has become known as the “spycops” operation, and their legal representatives and supporters. In many of these secret undercover operations the police have admitted to violation of human rights, abuse of police powers and causing significant trauma, including inhuman and degrading treatment breaching article 3 of the European convention of human rights. We are pressing for the current public inquiry into undercover policing to ensure that there is full disclosure of what took place, including who was targeted, by whom and how. Without this full disclosure there is no way of knowing the full extent of what happened during the dark years of this secret policing operation. The cosmetics retailer Lush has used its facilities to help us as victims press for full disclosure and reform so that this never happens again. This is not an attack on police; it serves to help all those in the police service who wish to uphold the highest standards of policing. For this we thank Lush for its support. We condemn those who have misrepresented Lush and our campaign and especially those who have sought to intimidate Lush staff. The above letter was signed by over 70 individuals and groups, including Police Spies Out Of Lives, and published by the Guardian last week. On 6th June, the Guardian reported that three more ‘Non State Core Participants’ had come forward to add their voices to the campaign, and speak up in support of Lush: two women who used to be married to officers, and the 32-year-old man who only found out in 2012 that his biological father was one of the spycops, Bob Lambert. I am deeply concerned by the attacks on Lush in the media, and even the intimidation of its store staff, for the spy-cops campaign it has chosen to support. The criticisms of Lush are distracting from the serious issue it is trying to highlight. I’ve been struggling to get answers for years, but rather than talk to me the police decided to force me to seek answers through the courts. I had to listen to their very expensive taxpayer-funded lawyers try and throw out my claim for damages. My very existence is the result of undercover policing, so I struggle to understand where I fit in as a victim of their actions. The fact is, if they didn’t sleep with those they were spying on, I wouldn’t be here today. I grew up with no memory of my biological father, I was told he had to leave me when I was two years old to go on the run from the police as a result of a direct action. I spent some of my teenage years trying to track him down, but my mum and I had no luck. He was really good at being on the run, it seemed. It was my secret that I would not even share with my closest friends, for fear that I may get him into trouble. In a strange way I was quite proud of him – a person who was uncompromising and acted on principle. I always lived with the hope that one day we could meet and chat – I would have forgiven him, I just wanted to talk with him, I could have helped him build a new life. Since finding out his true identity, I have struggled to understand my true identity. I was no longer the son of an animal rights activist on the run, but the son of a cop. But still, I forgive him, like I said I always would – if I was ever given the chance to meet him. What I can’t yet forgive is the police allowing me to go my whole life without telling me the truth. People at the very top, people in the Home Office perhaps? They must have known about my existence? To what extent did senior officers condone or direct me being fathered or fatherless? They chose to allow me to live my whole life not knowing who my father was – they thought it was fine to allow the lie to continue forever. If it wasn’t for the work of activists and journalists exposing undercover police, would I have ever found out? The police denied me the chance to meet my father earlier, to forgive him earlier, and to build a relationship with him when I was struggling to develop an identity of my own. These are some of the issues the police refuse to engage with me about. 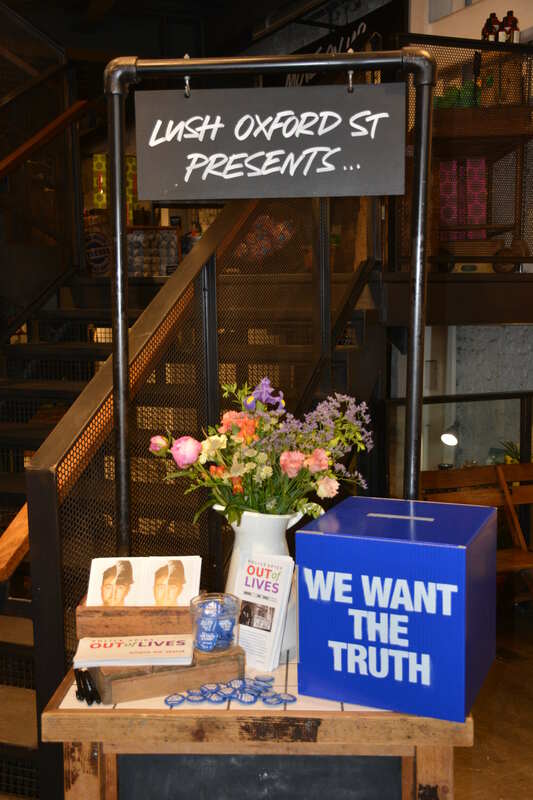 This is why I am so grateful to Lush for using its high street shop windows to highlight what the police and state get up to in order to suppress political activism they don’t agree with. If it takes a soap company to do this then well done that soap company. The cynicism around its motives is a distraction – a deliberate attempt not to engage with the serious consequences of police actions. The police have chosen to ignore me but hopefully the Lush campaign will draw attention to the real tragedy resulting from their actions. Maybe it can teach them to face up to their wrongdoings in the past, to accept the hurt and pain they have caused people – even allow for people to forgive them and start to build trust in them again. To attack Lush is to side with the current police approach of not talking with me and other victims, not allowing us to know the truth, put right the injustices caused, and move on with our lives. Rather than join in with the cynical attacks on Lush, Sajid Javid should use his position to demand the police properly engage with the public inquiry into undercover policing and allow citizens to rebuild trust in their police force. This is the first time ‘TBS’ has spoken up, but we hope it will not be the last. Although we are not involved in the Lush campaign, we recognise that it draws attention to legitimate concerns about how the inquiry is proceeding. Lush’s campaign is not an attack on hard-working police officers and we ask critics of the campaign to hold an open mind, look into the facts of this issue (which relate to a specific unit of undercover officers only – see uk.lush.com/article/spycops-statement) and to note that the families of undercover officers are also victims of this scandal. Together with other core participants, we still await answers. ‘HAB’ waived her anonymity last week, as confirmed by the Inquiry. Her name is Jennifer Francis.